There are invitations to mail, cake samples to try, and flowers to pick out. You don’t really have the time to design a wedding website from scratch. Don’t worry, as a Jetpack user, you won’t have to. You automatically have access to more than 100 free, ready-made themes to choose from. Professional plan users can also select from 200 additional themes that boast enhanced features as well. To help you avoid option overload, we’ve selected three particularly wedding-worthy themes that include mobile responsive layouts. This way, your wedding website will look great whether your guests view it on mobile devices, tablets, or desktop computers. Displaying important information at-a-glance. Wedding’s layout includes a spot in the footer area of every page that makes it easier for guests to quickly find critical details, such as the venue address, contact information, and things to do in the area. Presenting the couple. The homepage of this theme features an area created especially for portraits of you and your love, along with your names and short introductions. Introducing your wedding party. In addition to the standard layout options, Wedding includes specially-designed templates meant to feature your bridesmaids and groomsmen. RSVP. Forms gives you the ability to add an RSVP or contact form directly to your site. This way, you can skip the stamps and reply cards and allows your guests to respond digitally. Countdown timer. Get your attendees excited by telling them exactly how much time is left — right down to the second — until the big event, using the Milestone Widget. Guestbook. Have friends and family sign your digital guestbook using the comments feature. This is especially handy for guests who may be unable to attend your wedding but still want to send their best wishes. Announcements. 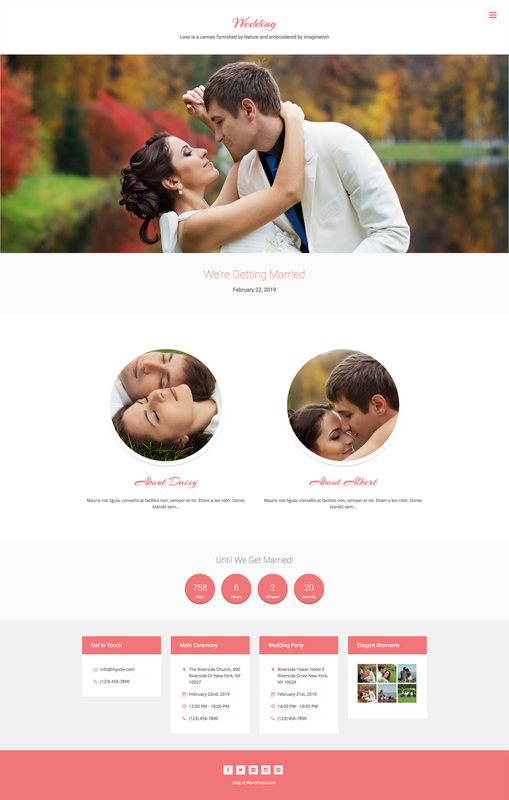 If you don’t want or need an entire website to let your loved ones know that you’re getting hitched, Affinity’s one-page layout is a great alternative. Showcasing photography. Shine a spotlight on your favorite engagement photos with Affinity’s widescreen display format. Additionally, WordPress lets you adjust the opacity of the header image for better contrast with text. Simplicity. This minimalistic theme is designed to highlight 3-5 featured photos and the essential details of your wedding — no fuss, just the facts. Scrolling images. Featured photos include a scrolling effect that visually ties each panel together. Check out the theme demo to see it in action. Guestbook template. Highlight your visitors’ comments with a specially-designed template. Social links. Social Media Icons are an easy way to encourage your site visitors to follow your wedding updates on your personal social media accounts. Typography. Those who value the finer presentation details will also welcome the care put into the typography and layout of this theme. Engagement photos. Give your images the space they deserve by displaying a different wide-format, high-resolution image on each page of your site. If you have a lot of photos that deserve attention, you might also create a stunning Portfolio to display multiple galleries. Blogging. Get your attendees invested in your journey by blogging about the events leading up to your big day. If you blog along the way, you can also reminisce about these moments on your anniversaries in the future. Custom logo. If you have a unique logo for your wedding, Luxury places it in the center of the page, distinguishing your once-in-a-lifetime event. Landing page. If you need a placeholder page but aren’t ready to unveil your full website just yet, Luxury includes a custom landing page template that enables you to publish just the pertinent details of your event before launching your full site. Multiple color options. The default color palette for Luxury combines rich, dark tones with gold highlights. If you like the theme’s layout, but think that different hues would suit you better, you can choose from additional color schemes with the click of a button. Finally, what if you could do something that would both save your friends and family a trip to the store to purchase wedding gifts while reducing the amount of time you spend returning duplicate gifts? Jetpack makes things simpler for you and your attendees through the Simple Payment Button. This tool adds a secure and convenient way for your guests to gift you directly via your PayPal account. The Simple Payment Button works with each theme mentioned above, plus any other theme you may choose (or design yourself). With WordPress and Jetpack, the tools that you need to create the perfect wedding website are at your disposal. Try out elegant themes, allow your guests to RSVP online, share memories leading up to the big day, and more. Did we spark any ideas for your wedding website? Which theme will you say “I do” to? Leave a comment or link to your wedding website created with Jetpack below! This entry was posted in Website Design and tagged Milestone Widget, portfolio, simple payment button, Themes, Wedding. Bookmark the permalink. As a wedding DJ, I think this is a great idea that I’d love to share with my customers. However, just a tiny issue I noticed: whenever I tried to click on any of the screenshots to view them at full-size, it just reloaded the post, rather than showing me the image. Using Firefox 61 on Windows 10. Howdy! Thanks so much for letting us know about this. Oh, and you can always click on the names of the themes to see live previews on your site or demos instead!